6 | Oncology Advances The multidisciplinary team in the new Thyroid Cancer Center at Dana-Farber/Brigham and Women's Cancer Center, led by Director Jochen Lorch, MD, is employing novel approaches to the evaluation, diagnosis, treatment, and management of all forms of thyroid cancer, as well as nodular disease. "Our Center delivers comprehensive evaluation and care using tailored approaches for each patient, from assessment of nod- ules and surgical treatment to targeted therapy for metastatic thyroid cancer," said Dr. Lorch. Molecular and Genetic Analysis A variety of advanced techniques are employed to evaluate thyroid nodular disease, confirm a new thyroid cancer diagno- sis, or assess recurrent or malignant disease. 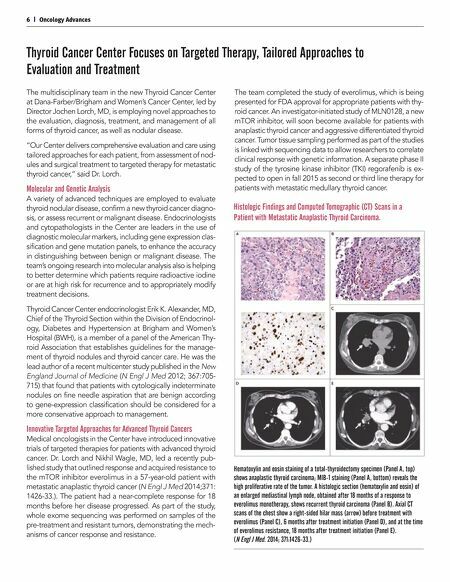 Endocrinologists and cytopathologists in the Center are leaders in the use of diagnostic molecular markers, including gene expression clas- sification and gene mutation panels, to enhance the accuracy in distinguishing between benign or malignant disease. The team's ongoing research into molecular analysis also is helping to better determine which patients require radioactive iodine or are at high risk for recurrence and to appropriately modify treatment decisions. Thyroid Cancer Center endocrinologist Erik K. Alexander, MD, Chief of the Thyroid Section within the Division of Endocrinol- ogy, Diabetes and Hypertension at Brigham and Women's Hospital (BWH), is a member of a panel of the American Thy- roid Association that establishes guidelines for the manage- ment of thyroid nodules and thyroid cancer care. He was the lead author of a recent multicenter study published in the New England Journal of Medicine (N Engl J Med 2012; 367:705- 715) that found that patients with cytologically indeterminate nodules on fine needle aspiration that are benign according to gene-expression classification should be considered for a more conservative approach to management. 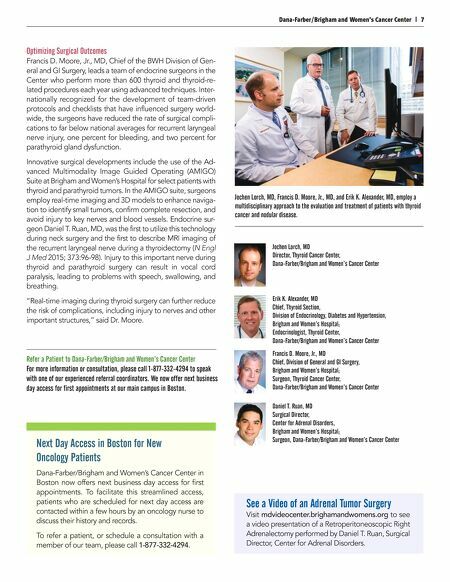 Innovative Targeted Approaches for Advanced Thyroid Cancers Medical oncologists in the Center have introduced innovative trials of targeted therapies for patients with advanced thyroid cancer. Dr. Lorch and Nikhil Wagle, MD, led a recently pub- lished study that outlined response and acquired resistance to the mTOR inhibitor everolimus in a 57-year-old patient with metastatic anaplastic thyroid cancer (N Engl J Med 2014;371: 1426-33.). The patient had a near-complete response for 18 months before her disease progressed. As part of the study, whole exome sequencing was performed on samples of the pre-treatment and resistant tumors, demonstrating the mech- anisms of cancer response and resistance. Thyroid Cancer Center Focuses on Targeted Therapy, Tailored Approaches to Evaluation and Treatment The team completed the study of everolimus, which is being presented for FDA approval for appropriate patients with thy- roid cancer. An investigator-initiated study of MLN0128, a new mTOR inhibitor, will soon become available for patients with anaplastic thyroid cancer and aggressive differentiated thyroid cancer. Tumor tissue sampling performed as part of the studies is linked with sequencing data to allow researchers to correlate clinical response with genetic information. A separate phase II study of the tyrosine kinase inhibitor (TKI) regorafenib is ex- pected to open in fall 2015 as second or third line therapy for patients with metastatic medullary thyroid cancer. Hematoxylin and eosin staining of a total-thyroidectomy specimen (Panel A, top) shows anaplastic thyroid carcinoma; MIB-1 staining (Panel A, bottom) reveals the high proliferative rate of the tumor. A histologic section (hematoxylin and eosin) of an enlarged mediastinal lymph node, obtained after 18 months of a response to everolimus monotherapy, shows recurrent thyroid carcinoma (Panel B). Axial CT scans of the chest show a right-sided hilar mass (arrow) before treatment with everolimus (Panel C), 6 months after treatment initiation (Panel D), and at the time of everolimus resistance, 18 months after treatment initiation (Panel E). (N Engl J Med. 2014; 371:1426-33.) Histologic Findings and Computed Tomographic (CT) Scans in a Patient with Metastatic Anaplastic Thyroid Carcinoma.